Players are now bagging and tagging for the night. After the recent eliminations of John David Rogers and Tim Reilly, there will be 13 players returning tomorrow morning at 11am. John David Rogers shoved all in and action folded to Steven Tabb in the big blind who asked for a count. Upon hearing the total of 216,000, Tabb made the call. The flop came [kh][5c][6h] giving Tabb the lead with his pair of kings. 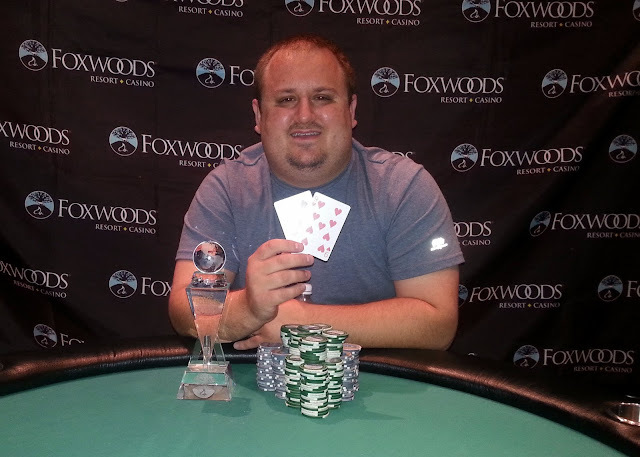 The [kd] turn and [5h] river ensured Rogers' Elimination in 15th place. We are down to 15 players with just about 30 more minutes left of play in Day 2. Julie Bae shoved all in and Soukha Kachittavong called. When the flop came [8h][7s][kc] Bae just shook her head. The [3s] turn and [9d] did not improve her hand and she was sent home in 26th place. Je Wook Oh raised to 17,000 in middle position, Bobby Corcione called on the button, and the player in the big blind shoved all in for 16,500 total. Oh and Corcione checked it down as the board ran out [5s][5d][10d][7d][9s]. Oh announced, "Two pair," as he turned over [ks][9c]. Corcione folded and the player in the big blind showed [qh][6h], before gathering his belongings and walking away from the table. We are down the final 28 players, with 27 spots paid. A player in middle position raised to 12,000. Matthew Wantman shoved all in from the cutoff, and a player in the small blind reshoved over the top. The player in middle position asked for a count of the blind's chips and upon hearing the 100,000 total, called. 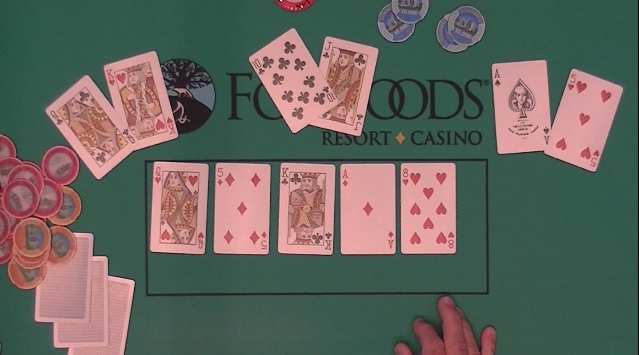 The flop came [js][5d][6s] leaving the pair of twos in the lead. But the [10c] on the turn gave Wantman a pair of tens. The [5s] on the river meant the small blind was eliminated from play. Wantman tripled up to 125,000 and the player in middle position was awarded the side pot. The 35 remaining players are now on their 60 minute dinner break. 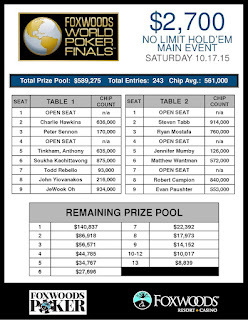 They will return back to Level 17 (2,500/5,000 blinds with a 500 ante). Action folded to Ted Driscoll in the cutoff who made it 5,500. Peter Wagner smooth called on the button, and Matthew Wantman raised to 16,500 in the small blind. Spiro Mitrokostas shoved all in from the big blind, and with action back on Driscoll he asked for a count. Upon hearing the 56,200 total, Driscoll shoved all in over the top. Wagner folded. and Wantman folded [jh][jd] face up. "I can beat anything but aces here," Mitrokostas said turning over [ad][ks]. Driscoll tabled [as][ah]. 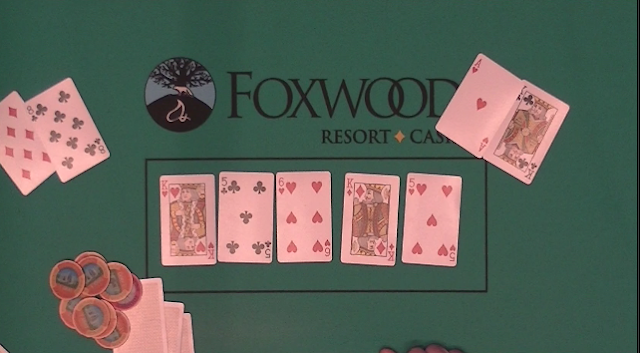 The flop came [ac][6d][8d] giving Driscoll a set of aces. 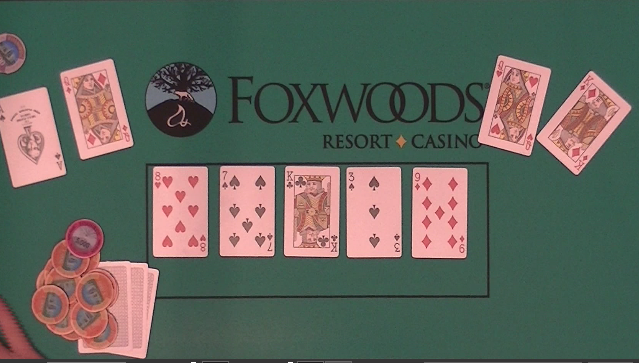 But when the [10d] hit the turn it gave Mitrokostas a diamond flush draw. Luckily for Driscoll the river came the [8h]. Mitrokostas was eliminated from play and Driscoll is now sitting with 280,000. Registration is open until the start of Level 11 for any wishing to enter or re-enter before that time. The structure sheet for this event can be found here. Carlo Sciannameo wishes his wife Mary a very happy birthday (a big milestone birthday!) He loves you so much and wants you to know he is thinking of you while playing here in the Foxwoods Main Event. On a board reading [qs][jd][10d], John Roy shoved all in and was called by Aditya Prasetyo . Brad St. Vincent (not involved in the hand) said, "You have the Royal Flush freeroll." When the [8d] came on the turn a player at the table gasped, as it gave Prasetyo another out to take down the pot with a flush. When the [7d] hit on the river, Prasetyo made his flush and Roy was eliminated from the tournament. There were a total of 243 over the course of two flights in Event #19. John Roy shoved all in pre flop and was called by Derek Chin. Roy showed [10s][10h] and Chin turned over [as][jd]. The board ran out [kc][9d][6s][4c][4h] awarding a full double to Roy. On a board reading [8d][6h][3s][10h][9c], Tim Reilly bet 8,900 in the big blind and Steven Tabb raised to 24,000 in middle position. Reilly thought for a few moments and talked aloud to himself about the possibility that Tabb had queen-jack for the straight. After a few more moments of thinking, Reilly released his hand and shook his head. Reilly is now sitting with 160,000 and Tabb with 190,000. On a board reading [qs][jc][5d], Charles Bunker bet 5,000 from the small blind. Bobby Corcione raised to 11,500, and Bunker called. When the [4s] came on the turn, Bunker shoved all in, having Corcione covered. Corcione quickly called. When the [ad] came on the river, Bunker made two pair, but it wasn't enough to win the pot, as Corcione had flopped a set of jacks. Corcione is now sitting with 65,000. A player in middle position raised to 500, Concetta Rinaldi called in the cutoff, and Joseph Drory raised to 1,200 on the button. Haralambos Saridis called in the big blind as did the other two players. All players checked the [kc][10c][5c] flop. Saridis, the player in middle position, and Rinaldi all checked the [9h] turn. Drory bet 1,200, and Saridis raised to 3,300. Middle position and Rinaldi both folded, and only Drory called. Both players checked the [jh] river. Saridis turned over [jd][jc] having rivered a set of jacks. Drory shook his head as he threw his cards face down into the muck. Saridis is now sitting with 32,000. Tim Reilly has just taken his seat. Tim opted to re-buy today after getting coolered in yesterday's Flight A. Our feature table includes Dave Stefanski (current chip count is 18,200), Tim "TK The Boss" Kelliher (35,000) , and Fred Paradis (29,000). The live stream can be seen at www.foxwoodslive.com. Other notables in the field include Chris Tryba, Randy Spain, Raj Patel, Joe Heinzmann (recent winner of Event #9 $300 HOSE), Steven Tabb (recent winner of Event #11 $1,200 NLH), and Kevin Calenzo (recent winner of Event #5 $300 NLH Multi-Flight Event). Event #19 Flight B is underway. We are having some troubles with the internet connection and are working with IT to get our live stream up and running. Please stay tuned to www.Foxwoodslive.com as the stream of our feature table featuring Dave Skelanski and "TK the Boss" should be up and running momentarily. The remaining 32 players are now bagging and tagging for the night. 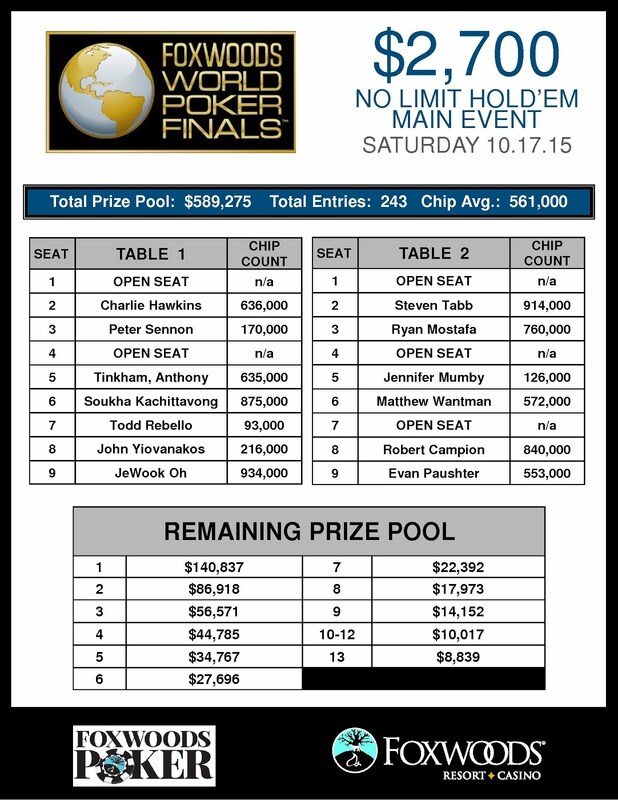 A full list of players names and chips counts will be posted as soon as they are available. The 40 remaining players have just begun the last level of the night, Level 10 (500/1,000/ with a 100 ante). So far today, Flight A had had 81 registrants. Players can buy in until the beginning of Level 11 (start of Day 2) and there is also a second Flight (B) tomorrow morning at 11am. A few notables to be eliminated from Flight A so far today: Dave Stefanski, Tim Reilly, Johanssy Joseph, and Matthew Wantman. On a board reading [ad][kh][qc] Tim Reilly checked under the gun and Robert Campion bet 8,000 in the cutoff. Reilly called. Reilly again checked when the turn came the [2c], and Campion bet 10,000. Reilly shoved all in and the Campion quickly called. Campion had flopped two pair holding [as][qs]. But Reilly had flopped Broadway holding [js][10s]. Unfortunately for Reilly, the river was the [ah] giving Campion a full house and leaving Reilly with less than a big blind behind. The next hand, Reilly was all in blind in the big blind for 250 (blinds are currently 300/600 with a 75 ante). Jeremy Meacham raised to 1,250. Robert Campion called in the hijack and the button called as well. The flop came [ad][qd][3h]. Meacham contiued for 2,000 and only Campion called. Both players checked the [3d] turn and [10h] river. Reilly turned over [kc][3s]. Meacham showed [ac][6c] and Campion showed [ah][9s]. Meacham and Campion chopped it up, and Reilly was sent to the rail. Just got 4 outered for 100k pot with the nuts vs top 2 on turn Out and back at it tomorrow. 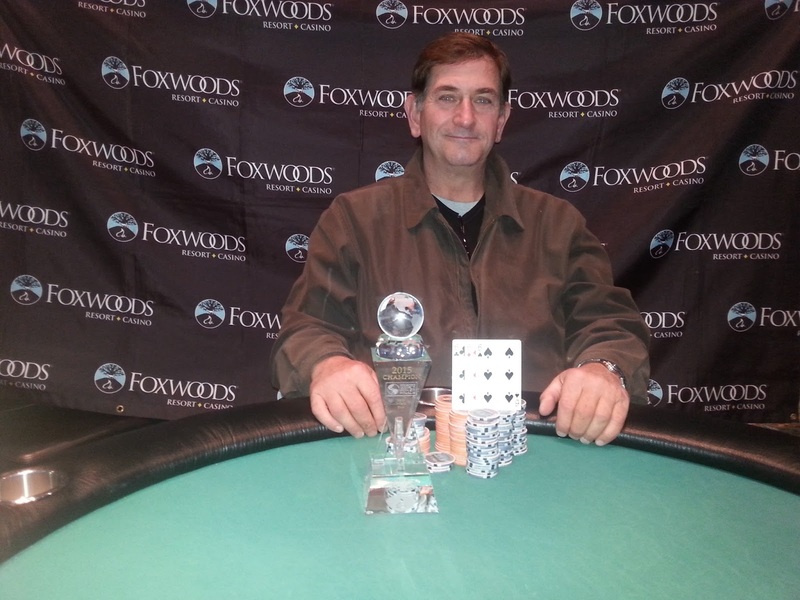 Made dinner break of @FoxwoodsPoker $2700 Championship with 58,700 coming back to bb500. Let's go. The current 55 players in the field are now on a 60 minute dinner break. Play will resume at 6:30 pm EST. A player in the hijack limped in for 300. James Campbell raised to 1,000 on the button. Robert Campion called in the small blind, Johanssy Joseph called in the big blind, and the player in the hijack also called. The flop came [qc][10d][6h]. It checked around to Campbell who bet 2,000. All three players called. All players checked the [10h] turn and [5c] river. Campion showed [7d][7s], Joseph folded, the player in the hijack folded, and Campbell turned over [qs][8s] to take down the pot. Campbell is now sitting with 85,000 in chips. A player in the hijack raised to 800, the player in the cutoff re-raised to 2,200, and Dave Stefanski made it 5,725 in the small blind. The original raiser folded, and only the cutoff called. The cutoff checked with the flop came [8s][5c][4h] and Stefanski bet 4,500. His opponent called. Both players checked the [6c] turn and [9h] river. 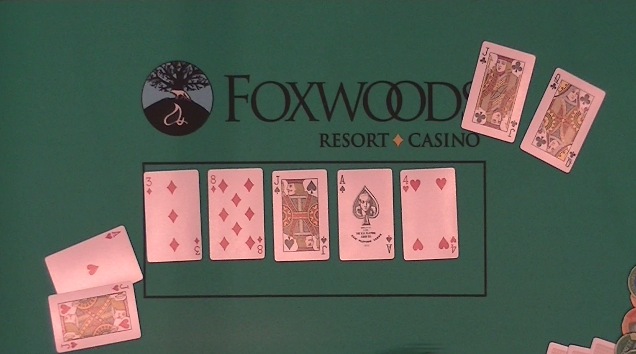 Stefanski showed [ah][qd], but his opponent turned over [qs][qc] to take down the pot. Stefanski is now sitting with 18,300. There were 61 entries so far today, and currently there are 52 remaining. Players are in the middle of level 5 (150/300 blinds with a 25 ante). Registration is open until the start of Level 11 (start of Day 2). There is also a Flight B that will be held tomorrow (Saturday Oct. 17th) at 11am. Day 2 will be held on Sunday at 11am, and Day 3 on Monday at 11am. 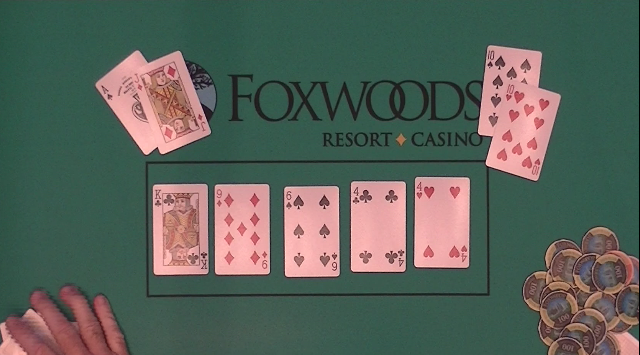 After the river card came on a board reading [ah][6s][4s][kd][kh], Kurt Lichtman bet 3,700 and Peter Sennon tank-called. Lichtman turned over [ad][ac] and Sennon showed the case ace holding [as][js]. Lichtman is now sitting with 28,000. On a board reading [7d][5s][kd][qc] a player in middle position had shoved all in and Bobby the Bus called. "The Bus" turned over [5d][5h] for a flopped set against his opponent's [kh][qh]. The [6h] on the river did not improve his opponent's hand and he was elliminated. "The Bus" is now sitting with 40,000 in chips. "You Guys Are Just Too Good"
On a board reading [ad][5c][7h][qd][qh], Matthew "Bucky" Wantman had bet 10,000, and Christopher Macneil had shoved all in. Wantman went into the tank. After a minute of thinking it over he said, "nice hand," as he mucked [5h][5d] face up into the middle. Macneil turned over [ac][ah]. "I also thought you might have had ace-queen," Wantman said. Another player not involved in the hand said, "I want a table change, we've got Bucky over here just folding boats. You guys are just too good"
Event #19 ($2,700 NLH Championship) has officially kicked off. This event has a starting stack of 30,000 and features 60 minute blind levels. This is sure to be a star-studded event. At the present moment a few of the notables in the field include Je Wook Oh, Stanley Lee, Matthew Wantman, "The General", Johanssy Joseph, and Dave Stefanski. At the present moment there are 36 entrants. Anyone wishing to enter/re-enter has until the beginning of the 11th Level to do so. There were 59 entries in Event #18. There were 115 entries in Event #17. 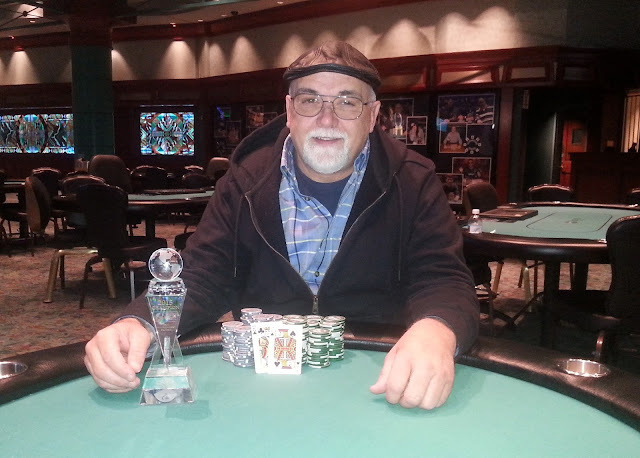 After a chop deal made between the final three players, and then playing it out for the trophy and title, it was Robert Campion that would claim the victory and $7,583. Chris Wall was all in and called by Robert Campion. The board ran out [ks][4s][4c][6h][qh], eliminating Wall in 2nd place and making Campion the newest Foxwoods title holder. On a board reading [6s][7h][3d][3h], Robert Campion shoved all in and Chris Wall called. The [7d] came on the river, and Campion was awarded a full double up to nearly 2,00,000. Mackenzie Kraemer shoved all in from the big blind. Robert Campion asked for a count and upon hearing that it was less than 300,000 to call, he opted to call. The flop came [qh][js][7c] giving Campion the lead with his pair of sevens. The [7s] on the turn pushed Campion further into the lead with his trip sevens. The [6d] came on the river, sending Kraemer home in 3rd place with a payday of $7,583 as the final three players had made a three-way even chop deal. Chris Wall limped in, Mackenzie Kraemer raised to 74,000, Wall reraised to 194,000, Kraemer shoved all in, and Wall called. The board ran out [qs][5h][4c][3c][2h]. Wall now has 1,500,000 in chips. Kraemer is sitting with around 300,000. Raj Patel shoved all in and was called by Mackenzie Kraemer. 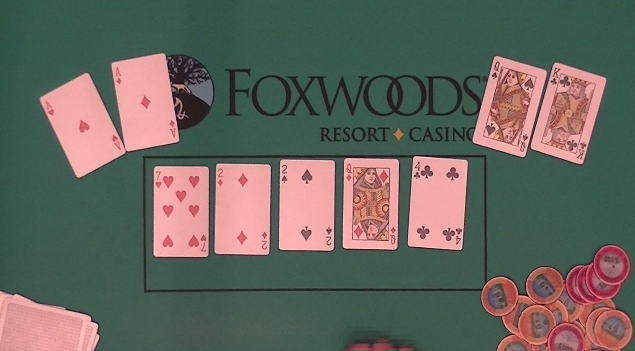 The flop came [as][3c][qc] giving Kraemer two pair. The [8c] turn and [5s] river did not help Patel and he was sent home in 4th place. Raj Patel made it 60,000 from the cutoff, and Mackenzie Kraemer shoved all in from the small blind for 515,000. Patel called. The board ran out [6d][4h][qs][3d][js] to give Kraemer the full double up. Marcel Parizo open shoved all in and Raj Patel called. The board ran out [ad][jd][9s][7h][2h] eliminating Parizo in 5th place, and chipping Patel up to nearly 700,000. Marcel Parizo shoved all in under the gun, and Robert Campion re-shoved for more on the button. Both blinds folded. 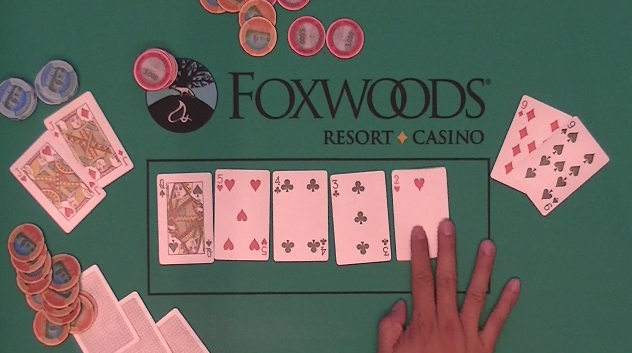 The flop came [10h][8c][7d] leaving Campion in the lead but giving Parizo a gut-shot straight draw. The [4d] did not improve Parizo's hand. But the [5s] on the river gave him the straight he needed to survive and he was awarded a full double up to 350,000. On a board reading [kc][8s][7h][ad], John Caputo shoved all in and was called by Chris Wall. The [4s] on the river did not improve Caputo's hand and he was sent home in 6th place. With blinds at 6,000/12,000 with a 2,000 ante and on a board reading [8s][4s][2h][js], George Chen shoved all in for 103,000 and was called by Rajo Patel and Marcel Parizo. Both Patel and Parizo checked in the dark. The river came the [7h]. Patel turned over [10s][6s] for the flush, Parizo mucked his cards face down, and Chen showed [2s][2c], having flopped a set of twos. Patel is now sitting with 850,000 and Parizo with 250,000. Marcel Parizo limped in from the hijack and Chris Korres shoved all in from the cutoff. Parizo called. Korres was ahead holding [10c][10d] against Parizo's [ah][3c]. But the flop came [as][jh][5s] reversing the lead. Korres would need help on the turn and/or river in order to prevent being eliminated from this tournament. The [5c] turn and [2d] river did not provide Korres the help that he needed and he was sent home in 8th place. On a board reading [jc][jh][ks][8c], Marcel Parizo was all in and was called by Chris Korres. Parizo had turned a straight flush draw holding [9c][10c]. Korres was ahead on the turn holding [jd][10h] for trip jacks. But the [3c] on the river gave Parizo the flush he needed to stay alive in the tournament and he was awarded a full double up. Parizo is now sitting with 350,000, and Korres with just a bit over 100,000. There are currently 90 runners in Event #17, the $400 NH Big Stack Bounty Semi-Turbo tournament. They are playing level 6 (150/300 blinds with a 25 ante). Anyone wishing to enter or re-enter this tournament has until the start of level 11 to do so. There were three players that shoved all in preflop. The board ran out [4c][7h][10d][6s][2d], eliminating Guy Bartlett in 10th place ($959), and Paul Siegel in 9th place ($1,151). 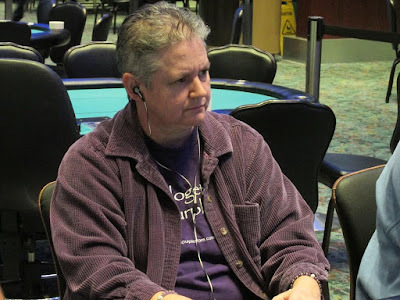 On a board reading [qh][5d][kc], Mackenzie Kraemer checked in the big blind, Paul Siegel bet 40,000 in the hijack, Rob Campion raised to 140,000 in the cutoff, and Guy Bartlett shoved all in on the button. 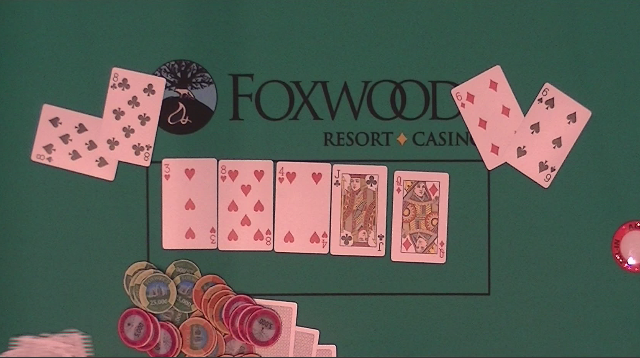 Kraemer folded his blind, Siegel shoved all in, and Campion did as well. The [8h] on the river did not improve Siegel or Bartlett's hands, and Campion was awarded a full double up. He is now sitting with just under 1,000,000 in chips. Siegel is left with 200,000, and Bartlett has 90,000. We are now down to the final table after Charles Shaffer was eliminated on Table 2.